A blow dart-wielding thug snatches a rare statuette from the Musée de l’Homme; anthropologist Jean Servais (Rififi) is kidnapped in broad Parisian daylight; serviceman Jean-Paul Belmondo begins his 8-day leave by changing to civvies in a Métro entrance and witnesses fiancée Françoise Dorléac (Catherine Deneuve’s sister, killed in a car accident 3 years later) getting kidnapped herself – and then the chase begins: by motorcycle, shoe leather, flight to Rio de Janeiro sans ticket or passport, airport baggage carrier, cable car, pink car complete with green stars and a rumble seat, water skies, Amazon river boat, seaplane, jungle vine… all shot in breathtaking widescreen and color. 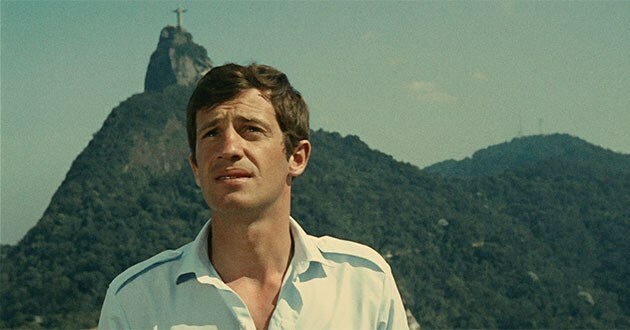 Even as Dorléac, rescued, is kidnapped again, Belmondo performs his own blood-curdling stunts against that sugar loaf Rio skyline and across that under-construction unearthly architecture of Brasilia (even parachuting almost into the jaws of a hungry croc). 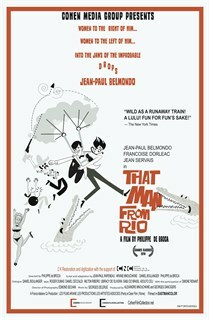 That Man From Rio is a crazy delight, a stylish, early-'60s pastiche that folds in every adventure-movie cliché you've ever seen, and possibly invents a few new ones.